Arriving in Tokyo’s Homamatsucho Station we walked 8 minutes to our Mitsui Garden Hotel Shiodome Italia-Gai. A cozy little hotel still under some renovations. You can see in the picture that the 1st two beds are pushed together and theres barely any room between the 2nd and 3rd beds. The Third bed was also against the wall. Again, our room was one with 3 beds (please see my article on ANA Crowne Plaza Hotel). One bed was large enough for me and my husband to sleep comfortably in. We only used two beds, but had to pay for three beds. Our room was very tight and terribly uncomfortable. We also had a small table and chair that just got in the way in our room. We had barely any room to walk especially once our suitcases took the only area left in the room. I can only speak about the room we were given, which was the last room down the hall (or the first, depends how you look at it). It may have been the way that room was designed, but the ventilation in the room was terrible. It was very humid after every shower, and the room had a slight musty smell every time we came back from our days adventure. So we started to leave the window in our room opened while we were out for the day. This made coming back to the room a little more pleasant smelling. Not only was there still some construction in the hotel, but there was construction right out side the hotel as well. While we did have a beautiful view of Tokyo Tower, there also was a huge construction crane in the way of our beautiful view. There was one restaurant in the hotel Italian Buffet and Cafe La Marea Unfortunately, the only time we wanted to eat there it was closed for renovation, but the day before we could smell the food and it did smell delicious. Luckily, Lawson Station (Japanese convenience store) was right next to the hotel and we just got a lot of great food to eat there. Free for guest is the public bath or sento. The night I went it was busy. There are about seven shower stalls and a large soaking tub. The view while soaking was amazing. Amenities at the public bath includes shampoo, conditioner, body soap, q-tips and hair dryer. I did see one washer and dryer on the ladies side of the public bath. It took ¥300 for the washer and ¥100 for the dryer. Free internet for all guest. The convenient location earn this hotel a 3.0 star. Only a 8 minute walk from Hamamatsucho Station, 7 minute walk from Onarimon Station, 12 minute walk from JR Shimbashi Station, about 15 minute walk to the famous Ginza Shops and only 16 minutes from Hamamatsucho Station to Haneda Monorail. Check out the access map. While the food smelled delicious, it underwent construction the night we wanted to eat there. The hotel had free internet access (we rented a mobile wifi so never needed to use the hotel wifi). The public bath was small, but still a nice touch. Construction across the street was noisy and the crane interfered with what could have been a nice view of the Tokyo Tower. Room was cramped with three beds and had poor ventilation which made the room smell musty. Would I stay here again? No, I wouldn’t. Opening the window for fresh air in the room helped with the musty smell. This commercial is adorable, I saw it while visiting Japan March 2014. After arriving at Narita Airport, we were exhausted. We stayed at ANA Crowne Plaze Hotel . It was the largest hotel we stayed at during our trip. In Japan when booking a hotel room, you will be charged per person per room. Typically, American hotels charge by the room. Japan usually has a limit on how many adults can stay in a room, commonly it is 2 adults per room (up to 2 children, ages can vary for each hotel). This made booking a hotel for my family a little difficult. I needed a room that accommodated 3 “adults” (my son is 18) that was near impossible, not to mention prices jumped up tremendously if a hotel offered a room for 3 adults. So we ended up with this gianormous room with three gianormous beds. We only needed 2 beds. But rules were rules. Getting to the hotel from Narita Airport was a cinch. Just hop on their complementary airport to hotel shuttle, about a 10 minute ride. We waited at bus post 16 at Narita Airport Terminal 1. There is also a bus pick up at Narita Airport Terminal 2, bus post 25. Be sure to check the hotel for the times of hotel pickup and location for pick up. Schedules and pick up spots can often change. We asked the airport information counter for the hotel bus pick up information. Currently this is the ANA Crowne Plaza Narita Hotel bus pick up schedule. Inside the hotel there is a convenient store, offering several sandwiches, onigiri, salads, curry dishes, many different drinks and snacks. We ate at the Ceres located on the first floor. During your stay you can enjoy and energize yourself in their fully equipped health club, take a few laps in the indoor pool, treat yourself to an invigorating spa treatment or simply enjoy a traditional japanese massage. With their complimentary shuttle service to Narita Town you can explore the famous Narita-san Shinsoji Temple and beautiful pagodas. Their double glazed windows make plane spotters enjoy the sky activity at Narita Airport without the noise. Thinking of getting married? Here at the hotel they offer wedding coordinators and photography too. Check out there site. You can have a banquet or your next meeting right here too. Check out there site. Enjoy the complementary toiletries included in your the room everyday. Toothbrush, toothpaste, hair band, shower cap, Q-tips, disposable razors and shaving cream. For more information on the hotel amenities, please check the hotel’s website here. I’ve traveled to Tokyo several times, all of which after I landed, I would continue onward to Tokyo. Despite the fact that Tokyo is about 35 miles from Narita Airport, it could take a few hours by public transportation. So, this time I figured I wanted to relax and not stress on how to get to my hotel somewheres in Tokyo before dark. ANA Crowne Plaza Hotel was nice, nothing fancy. I would give it 4 stars. The hotel was clean and the bed was amazingly comfortable, our room was huge. Amenities are good, my only complaint was the fact we were forced to rent a 3 bed bedroom when we needed only 2 beds. Each bed is large enough for 2 adults. My husband and I shared a bed of course and my son used the other bed. But, as I mentioned…. rules are rules, but its ridiculous the hotel used the fact 1 adult per bed just to charge more money. We all had a great nights sleep and were up early to start our day heading towards Tokyo. We would stay here again. This was posted in the room, yikes! For the past few weeks I’ve been planing a trip to Tokyo and Sapporo. One of the best airline ticket price finder I used was sky scanner. With sky scanner, you can set up air ticket price alerts to be sent to your email. You can even have them alert you if the ticket your looking for reaches a certain price you have in mind. You have the control when to be alerted. If you haven’t been to Japan, just know Japan doesn’t offer free wifi everywhere. Renting a pocket wifi is the best and cheapest way to get convenient internet while vacationing there. This trip I rented a pocket wifi from Global Advanced Communications. When I was looking up companies that offered pocket wifi rentals, several companies came up. I’m always weary about giving information and sending payments to a company overseas. I can assure you that this company is legit. 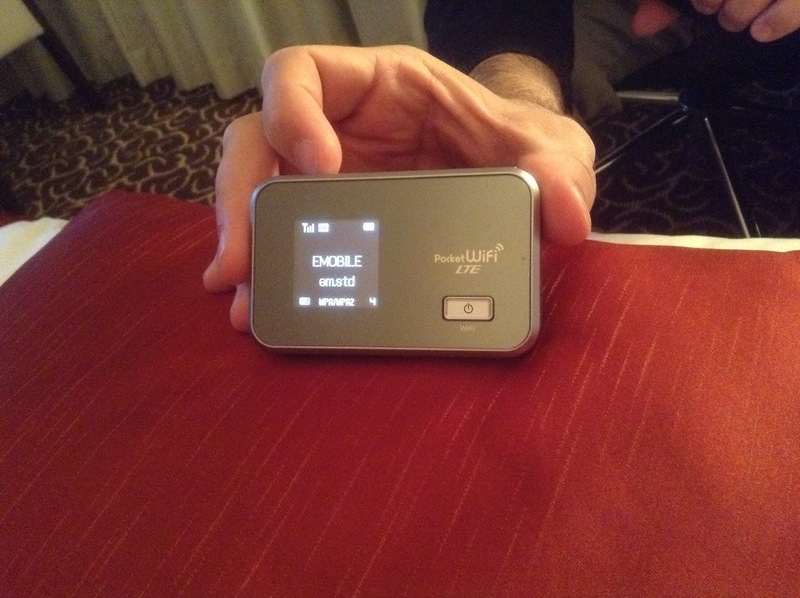 I took a chance and ordered my pocket wifi, I even had it sent to my hotel. Upon check-in my wifi was already here, super convenient. The two week rental cost me around ¥7,650 (about $76.50) this includes the prepaid envelope to send the pocket wifi back. I love it and glad I got it. Follow me around the next 14 days as I will be traveling around Tokyo and Sapporo.